Dragon Jumper: Free Edition. Download Free Dragon Jumper game. 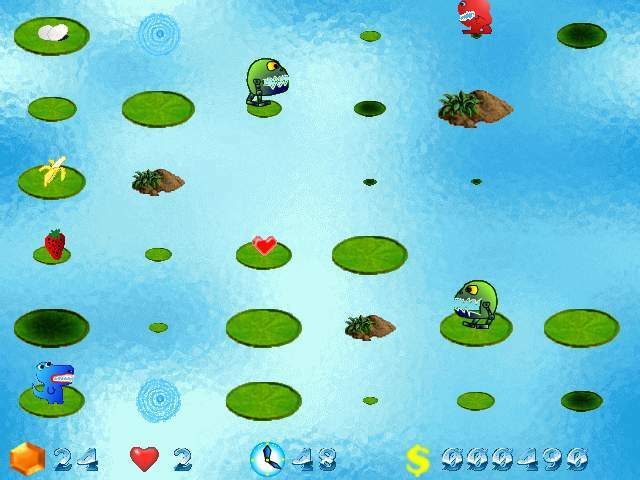 In this absolutely free Dragon Jumper game you play a little Dragon who lives in a magic lake. The lake is dangerous, but our little fellow loves fruits and diamonds. To finish each level you must get a big orange diamond. Dragon must jump from one place of the lake to another to catch it. Dragon can jump on the small islands and leaves of the lily pads. But lily pads are not stable; they go up and down all the time. Unfortunately, our little fellow can't swim; therefore he sinks if he jumps into the water. The jumps on the lily pads require a lot of energy; therefore Dragon should eat every turn. Dragon is always very hungry and his energy decreases gradually each second. If Dragon doesn't eat enough food for the long time, he dies. We have no player reviews for Dragon Jumper Free yet.